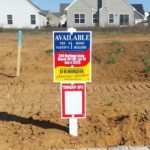 Lot Signs: Lot signs are perfect for new home builders, real estate agents or new home communities to mark out future homes and stay in compliance with building permits. 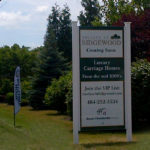 Lot signs give the potential buyer an idea of their new home, selling your homes! 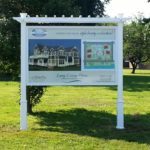 Pergola Signs: Pergola signs are perfect for any business, community, real estate or new home sign. These pergola signs are elegant and attractive to customers. A Frames: A-Frame Signs are perfect for any builder or business. Our A-Frames are offered in black or white. They are double sided and have removable panels. Banners: Banners are perfect for any occasion; we are priced competitively and will custom design your banner for the best possible design for all events. 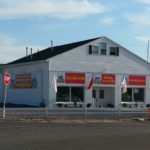 Burma Shaves: Burma Shave signs are a great way to advertise any amenities of your community. They can be staggered out side of your entrance or in the community leading to the sales model. 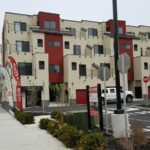 Brochure Boxes: We use heavy duty brochure boxes that will give the appropriate image for your new home or apartment community, plus these won't break in two months like the cheap plastic alternative. 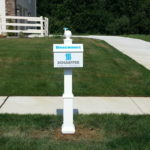 Post and Panel Signs: Community site signs are great for any builder to gain attention to their new community. We will design and install the sign right on site to gain maximum exposure to the community. 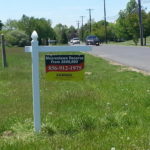 Yard Arms: Yard arm signs are the quality way of gaining the attention of interested home buyers. These recognizable real estate signs are perfect for outside of homes. The coroplast can be changed and the yard arm sign reused, saving you money. 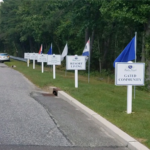 Flags: Community Flags are a great way to add a pop of color to your community's entrance. 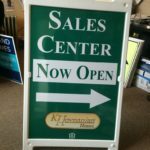 Advertising flags can help buyers turn right into your sales center!